Mix marshmallow creme, 2 cups peanut butter, and cereal together. Refrigerate 10 minutes. Meanwhile melt almond bark and 1 cup peanut butter in a double boiler. 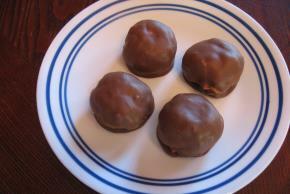 Form the cereal mixture into 1 inch balls and dip into the melted chocolate/peanut butter to coat. Place on wax paper to cool.